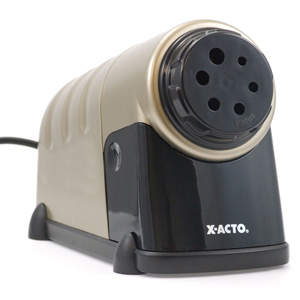 Electric pencil sharpeners from X-Acto are designed for demanding office, studio, and classroom environments. They are quality tools that will last for many years. Designed for steady, all-day use, X-Acto's Heavy-Duty 41 sharpener is a great investment for years of maintenance-free service. It has an extra heavy-duty AC induction motor with a thermal overload function that automatically shuts the motor off should overheating occur. It has two solid steel cutters with 30 cutting edges. The cutting action stops when the point is made. A pencil guide permits sharpening of all sizes of pencils. This model features an extra large shavings receptacle. Requires a 110V AC outlet. Beige finish.